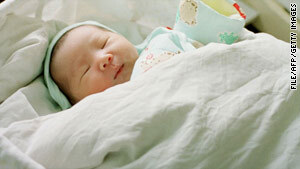 Isabella and Jacob were the most popular names for babies born in the U.S. in 2009. Isabella has replaced Emma as the most popular name for newborn girls in U.S.
(CNN) -- Move over, Emma. There's a new queen in town. Isabella dethroned Emma as the top name for girls born last year, according to the Social Security Administration's annual list of most popular baby names, released Saturday. Jacob, on the other hand, held on as the most popular boy's name for the 11th year in a row. The Social Security Administration started compiling name lists in 1997. And as in years past, the influence of pop culture is reflected in the names picked for newborns. The boy's name that rocketed up the list the fastest is Cullen -- the name of the lead character in the popular "Twilight" book series. Cullen's girlfriend in the books is Bella, short for Isabella. On the girls' side, the fastest riser is Maliyah, an altered version of the name of President Obama's daughter Malia -- which also is among the top 10 fast risers. But parents are equally quick to drop celebrity-inspired names once they think the popularity is passe. Among the biggest drops last year were Mylee and Miley, as in singer Miley Cyrus. Also on the outs: Lindsay and Jonas (think actress Lindsay Lohan and the band Jonas Brothers). Meanwhile, Barack continued to move up the list. Sixty-nine Baracks were born in 2009, the agency said. As always, religious names retained their popularity -- even if some were somewhat unconventional. Among the popular names are Nevaeh (heaven spelled backward) for girls, and Messiah for boys. The 10 most popular girls' names, in order, are: Isabella, Emma, Olivia, Sophia, Ava, Emily, Madison, Abigail, Chloe and Mia. The 10 most popular boys' name, also in order, are: Jacob, Ethan, Michael, Alexander, William, Joshua, Daniel, Jayden, Noah and Anthony.